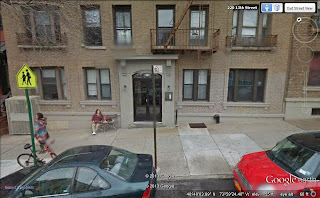 A Queens resident recently showed me a subway stop that can only be found on Google Maps: the mysterious 11th Street Cut, between 59th St & Queensboro Plaza. The phantom stop is located at the site of 60th Street Tunnel Connection, a line opened in 1955. And the purpose of the line? The 60th Street Tunnel Connection (also known as the 11th Street Connector) is a short connecting line of the New York City Subway connecting the BMTT 60th Street Tunnel under the East River (which connects to the BMT Broadway Line) with the IND Queens Boulevard Line west of Queens Plaza in Long Island City The connector does not have any stations. The connection opened on December 1, 1955, and permitted BMT trains from Brooklyn to use the IND Queens Boulevard Line; the first service to do so was the Brighton Beach Local (BMT 1, now Q). Unlike the later Chrystie Street Connection, this was of the nature of a trackage rights operation, without the mixing of BMT and IND equipment or crews, as opposed to a true operating integration. The connection now carries trains of the R service at all times but late nights. This kind of stuff may be a bit too arcane for the amateur straphanger, but if you're serious about subways you can read more about its route over at SubChat . As there never was a station here, it's unclear why Google has invented one. But it does make me dream of a manhole cover leading to a secret, perfectly preserved 50s stop, and that in turn reminds me that the MTA nostalgia train rides begin again tomorrow, running on Sundays throughout December between 2nd Avenue & Queens Plaza. I bet some of the SubChat guys will be there. You can see pictures from last year's holiday trains here. The beginning and ending of so many journeys. Usually I'm looking out of those lower windows as I get off the train. The panes are bleary and broken, but I like the vantage point. It's funny looking up at them, the other way around - a simple, pleasing change of perspective. I wonder if the top windows - sealed from inside - will ever open up views for the travelers waiting on the platform. I like a store sign with a 3D element. The giant ball point pen at A & L Pen Manufacturing Corp. (120 12th Street) is a good example. The A & L sign overwrites the earlier, Just Pen lettering, but the marketing line underneath may be Just Pen vintage. Whether its JP or A&L, the line has romantic resonance: "Ball Point Pen Assembly for the Writing Industry". Say that out loud - it has a good sound to it. There's another pen across the street, at A & L's more modern quarters, though the sign's a lot more generic. Also on this block, a breakdown of ironwork services. Two listings today - one in the South Slope & one in Sunset Park. At 161 16th Street (Fourth/Fifth), a single family townhouse, listed at $675,000. A townhouse in this area for this price, you might wonder? Well yes, of course, there has to be a catch or two. This is an exceedingly small building (14' x 25') on an exceedingly small lot (14' x 25'). Exactly! The house comes without even a handkerchief sized patch of dirt, as it directly abuts the parking lot for both the adjacent condo building & another on 15th Street. A group of similar rowhouses (broken by a gated entrance to the lot) share a common fate. The valiant IMBY wrote about remodeled 157 back in 2011, and you can see its 2 1/2 storey floorplan & some construction horror pics. here. 161 sold this October for $450,000, and has been flipped without renovation. Later that month it was listed at $799,000, and since then it has slipped incrementally to $749, $700, and now its current price. According to the broker (Keller Williams) it's "Ideal for Someone Who is Looking For More Benefits Than A Condo Can Offer." "Investor's opportunity! – Excellent investment opportunity in the heart of Sunset Park! The property is currently being used as a church facility but has great potential for many different uses or for condo conversion. Features: a full basement with 2 bathrooms, central heating & Air conditioning, backyard, 2 parking spaces. Zoned R6b. " The listing price for the building, at 416 46th Street, is $1,049,00, and the date of its construction is said to be 1909. At present the church on site is the Pentacostal El Camino. 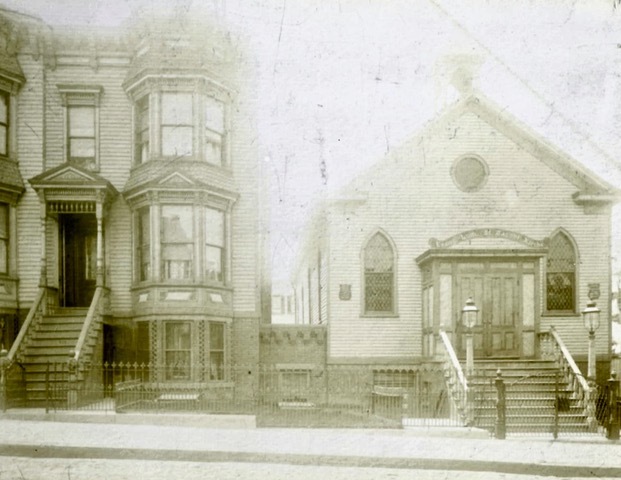 In 2013 I wrote about the history of the church on 46th, but I was confused by the different congregations that occupied the building, and much of what I wrote turned out to be incorrect. I'm replacing what I wrote with the words of a very nice correspondent who recently (and kindly) put me straight, and also sent a photograph of the church in earlier years. Thank you! The Pentecostal El Camino Church at 416 46th Street actually dates to 1890, not 1909, and was the first church built for the congregation of the St. Jacobi German Evangelical Lutheran Church, now located in the lovely Romanesque Revival building at 5406 Fourth Avenue, a church designed by architect J. M. Murphy and built by my grandfather Andrew M. Andersen. Andrew was a member of that first "Little White Church" congregation and a gifted stone mason and builder who also built St. Andrew’s Episcopal Church, designed by L.B. Valk & Son, at 4917 4th Avenue in 1893 at the age of 25. Born in 1868, Andrew was an 1882 immigrant from the North Frisian Island of Sylt, today the most northern island of Germany, but until the 1860s a province of Denmark. A brief history of "The Little White Church" can be found on the St. Jacobi Evangelical Lutheran Church Website (see the history page) along with a row of photos across the top of the home page. One of the photos is of my grandfather. From what I can gather, the church property was not sold, and the Iglesia Pentecostal El Camino is still active. It's good to know that the old church and its most recent congregation are still there on 46th Street. A chill was setting in this afternoon, and we're not likely to get above the freezing point for the next couple of days. I decided to stay close to home, and to start a project: a more methodical walk of all the blocks between Fifth and Third/Second, between 9th Street and 39th, which I'll then extend along right through Sunset Park. I'm not methodical by nature, which is fine for a walker. I like the rewards of aimless wandering, but this can mean missing a lot. I know many of these blocks extremely well, especially the ones through the 20s, but it's time to be more thorough. Maybe I'll go up to Sixth or beyond when I get further south. I guess I'll fill in the blocks on a map. The simplest and quickest of walks today: straight down to the end of 12th at the canal, and the Pathmark parking lot. I've often thought about how quickly I could get to Red Hook if only there were a bridge here. A small footbridge (of course) would be perfect, but water transportation - a dinghy, say - conveniently waiting by the chain link fence, would be a good alternative. The fence is even open for easy access! But no boat available on this side - only the North Star across the way. There's a kind of an end of the world feel down here in the big, lower-budget-supermarket parking lot, surrounded by water, chain link, highway, viaduct, and Big J's Wines and Liquors close at hand. Even the Lowe's lot next door, with similar views, feels more generically upscale. We're only nine blocks south of Whole Foods, but on this patch of ground we couldn't feel further from a new Gowanus market vision. West 13th Street, 2:30 p.m.
"Mark Reford, CEO of Basis Schools, told Community Board 6 last week that he decided to build the school in Red Hook because of its proximity to Park Slope, Carroll Gardens and Williamsburg, but that he also hoped the school could help Red Hook as well. “We are fully committed to be an enrichment to the Red Hook neighborhood,” Redford said. He said the school has no plans to offer scholarships when it opens in the fall of 2014 but he hopes to offer scholarships in the future. CB6 approved a special zoning permit for the school's construction last week on the condition that scholarships are earmarked for Red Hook children and that the company never convert the space into a charter school." The median income in the area of Red Hook Houses is $16,748. On December 11th, CB6 will vote again on the permit at the full board meeting. At this time of year, it's dark when I get home from work. Along the way, if I'm lucky, I'll catch some slipping sunlight. has a multi-family building for sale at 13th & Fourth, for $12,950,000. "There is considerable upside in the offering as the seven rent-stabilized units pay an average of $811 per month for two and three bedroom apartments worth approximately $2900 and $3900 per month. This property also presents a near-term opportunity for condo conversion as eighteen of the twenty-five units will be destabilized by the end of 2013. The demand for condominium units (sic - the sentence remains unfinished) "
From the Train: 7:00 a.m.
“People will be streaming down the street, shopping bags in hand,” Lemma said. The first cold weather of the season made for a morning train heavy on long-haul sleepers. Lying awkwardly, legs folded up, across a two person seat . Slumped sideways, with piles of color-drained shopping bags as pillows. Bent forward, hidden under hooded sweaters, heads resting on knees. Commuters with wrinkled noses shift away. A young man with a heavy suitcase and very little English, heads further into Brooklyn to the Port Authority. Is turned around and sent on his way, an innocent, back across the river. A woman steps into the train. Middle aged, with a tired face and long graying hair loosely tied. Sweatpants and wrinkled jacket. Around her neck, a sign on cardboard. When she starts to sing, her voice is a deep rasping flamenco lament, cracking and hovering right at the razor thin border of pitch. Right where it matters most. Two minutes of the midday train from Roosevelt westward. At Sutphin Boulevard an elderly, well dressed woman mutters under her breath as the lights of the F appear in the distance. "Fiiinally, the fukkint train." The "t"s so small and so precise against the train's rumble. On Friday night, a sixty-something couple in our car blows the competition clean away. The King and Queen of the Underground. They're wearing matching coats of pure white rabbit. Apart from the coat, he's in black leather, head to toe, with a broad brimmed hat, and silver studded boots. She's in fishnets and heels. They smile to each other and talk real low, and they just know we're all sneaking glances and feeling so damn unremarkable. At Jay Street, hand in hand, they run across the platform for the A.
Monday afternoon, at the newly reopened Long Island Restaurant (cocktail) Bar. Time for a photo shoot. A stone's throw from Silvercup Studios, at the corner of 43rd Ave & 21st Street, the Five Star is a strange combination of Indian Diner/Catering Hall these days, but the old letters on 21st attest to an earlier history. Two Percy Loomis (Loomis again!) 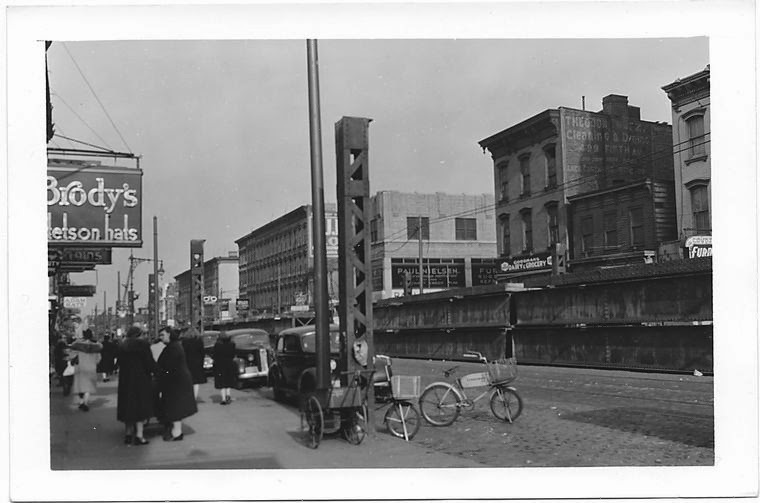 photos from 1940 show 43rd Avenue looking west from 21st. If you click to enlarge the page and focus on the top picture, you can see another Diner sign, set a little further down the street from this one. 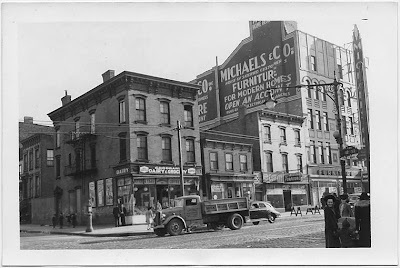 In 1940, the corner of the block was occupied by a gas station, and today there's an auto-part store & lot there. I guess Five Star and its old diner sign are descendants of the business Loomis photographed seventy plus years ago. Update: A couple of days after driving by here, an office email informed me that Five Star is the venue for our annual work knees-up! This is far too freaky a coincidence for comfort. Quite unexpectedly, at Urban Glass, a patron saint. Scaffolding is still in place to protect pedestrians from possible falling debris, and as of yesterday, the DOB site still featured a familiar yellow PARTIAL VACATE for this address. "The perfect place to call home or utilize as an investment property and rent immediately. The building is beautifully maintained and has a professional staff. It offers a 24 hour doorman, attended garage parking for a fee, fitness center, residents' lounge with pool table, and 2,500 s.f. landscaped terrace, in a prime location. Close to Prospect Park, the Brooklyn Museum and Brooklyn Botanical Gardens, as well as wonderful shopping, delicious restaurants, bars and lounges in this fantastic neighborhood ... "
Let's get away from the Brooklyn world of Lagos Gold honed limestone walls ( "with accents of Mosaic Toffee"! ), and the cut and thrust of higher end brokers, to a realtor on Astoria Boulevard. A plucky name and a good sign, with the old phone number boldly displayed, and only one cracked pane in the little house up top. I was browsing the NYPL digital gallery the other day, when I came across a couple of photographs by Percy Loomis. They were taken in the fall of '41, just as the Fifth Avenue El was being taken down. The first, dated October 29th, shows the view north to 12th Street. In it, you can still see remains of the El ironwork, a line of pillars shrinking towards the horizon. 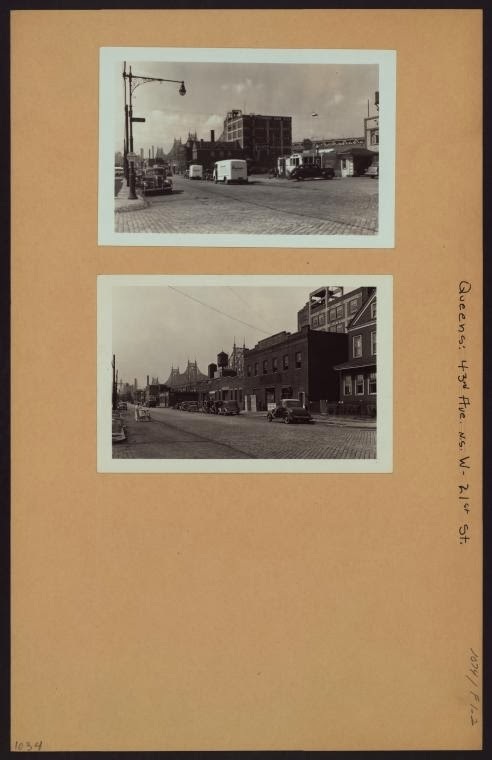 The second picture, taken just a few days later (November 4th), shows Fifth & 12th looking south, with Loomis standing more or less where Sleepy's is today. There are no El traces to be seen. I like seeing the El height wall signs. A Michael's one was still around when I first got here, but was covered a few years later as next door's building grew higher. The J.J.Friel ad, half hidden in the October picture, can still be seen today. And look at the store signs & businesses lost in the past: the Dairy & Grocery where Commonwealth is now, and that fabulous vertical Michael's sign, with its swishy deco styling. Is Brody's selling stetson hats - something I thought of as more western than mid-Atlantic? But I'm no hat historian. Or any kind of historian for that matter. In just two pictures there are so many details to take in: the cobblestoned avenue, the cars and trucks, the firebox on the corner (still one there today), the handcart at the corner. That small frame building next to the grocery, still surviving, sans period charms. The people. Those boys dawdling up 12th might still be around today, somewhere in their eighties, and perhaps one or two of them still cross paths. I'm drawn especially to the women at the bottom corner of the same shot. In cloth coats with fur-trimmed collars, two holding the hands of a small, woolen-hatted child. A couple of them face the camera, and while one's expression is too blurred to read, the other looks forward with an broad, open grin, so curiously meeting the lens she could walk across seventy years to greet you. Before daylight, the Esposito baby. Real Estate Monday - Upscale!